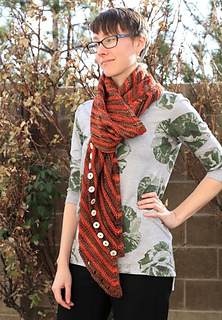 The Sweet Potato Cowl was designed as a “dish” to accompany the Jimmy Beans Wool Fit for a Feast 2014 collection. 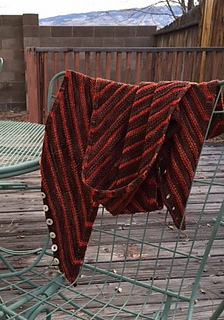 It all came about when Jimmy handed me a couple skeins of Fyberspates Vivacious DK and Malabrigo Rueca and said “What do you think?” Well, my muse was inspired and I began swatching that night. 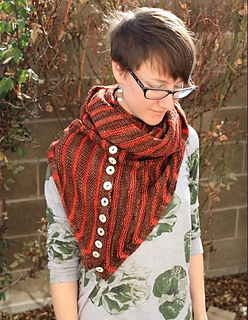 Being a fan of stripes, really long scarves, and cowls that are like blankets for your neck, -not to mention buttons- I wrapped them all into one for this sweet cowl/scarf combo. 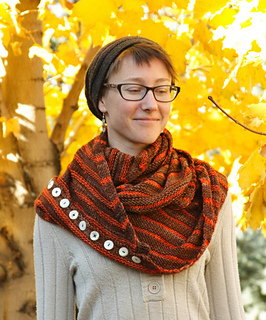 Easily customizable, the Sweet Potato Cowl is super long and can be worn as a scarf (unbuttoned), or as a cowl (buttoned). The buttons are optional if you’re going for a perma-scarf or perma-cowl (directions are included if you want to go button-less), and if extra-long isn’t up your alley, it is easy enough to stop early for a shorter finished product.